Dash-Mounted Control: Use the two variable-speed dials for independent adjustment of the auger and spinner control directly from the operator's seat. 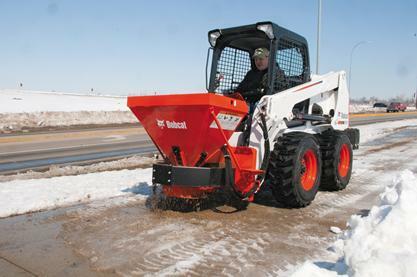 The Hydraulic Spreader (HS8) attachment is Bobcat's first hydraulic spreader. The self-loading hopper on the HS8 has an open top and can be used as a bucket, allowing an operator to efficiently fill the spreader from a pile rather than pour material into the top. With an 8 cubic foot hopper, the spread pattern is controlled by a hydraulic motor and three material flow gates that spread from 18 to 28 feet. The three individual gates, located on the hopper, maintain the rate of material spread.